Sometimes there is artifact in an ECG signal that results in a large number of erroneous R peaks being marked which would take a significant amount of time to delete individually. 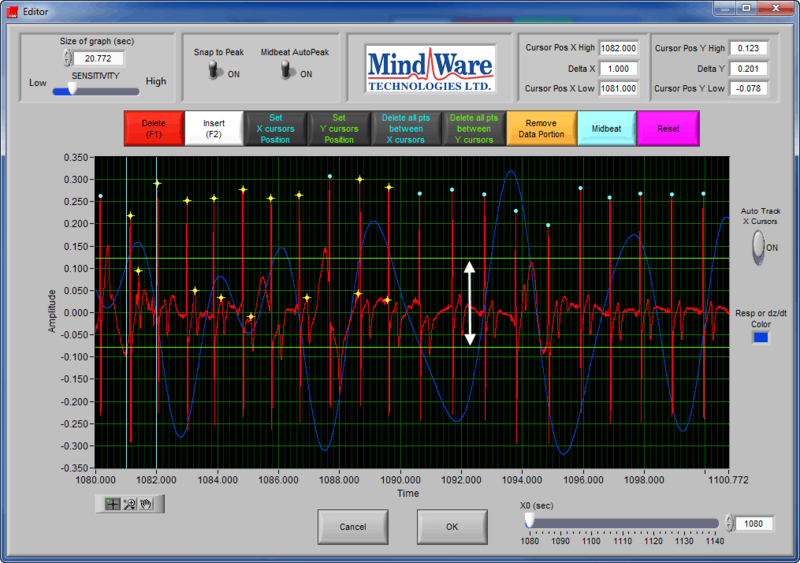 Luckily there are some tools in the ECG Editor for handling these situations efficiently. The beginning of this segment contains so much signal noise that it is impossible to identify the locations of actual R peaks. In addition, the peak detector has falsely identified peaks in the noise as R peaks which need to be removed. Using your mouse to grab and drag the X cursors, place one of them on either side of the noise. Press the Delete All Pts Between X Cursors button to remove all R Peak markers that fall between the X cursors. When deleting spurious R peaks in this way, don’t forget about the different editing techniques for HRV and Impedance Cardiography. Similarly, there are 2 horizontal green lines called the Y cursors. 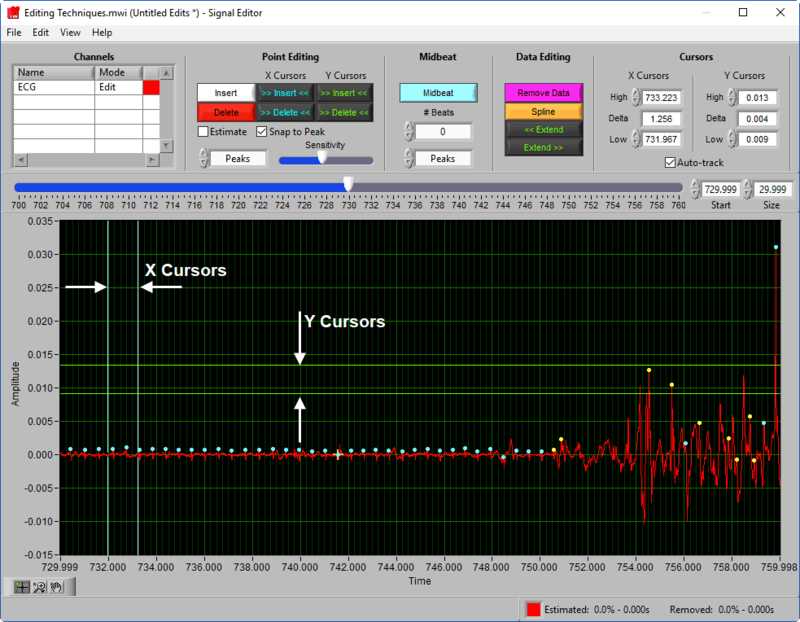 These cursors can be grabbed and dragged into position using the mouse much in the same way as the X cursors, except that these cursors define an amplitude range within which to delete spurious R peak markers. This particular ECG has some lower amplitude characteristics which have been falsely identified as R peaks. However it is obvious which of these are actual R peaks, and which are not. 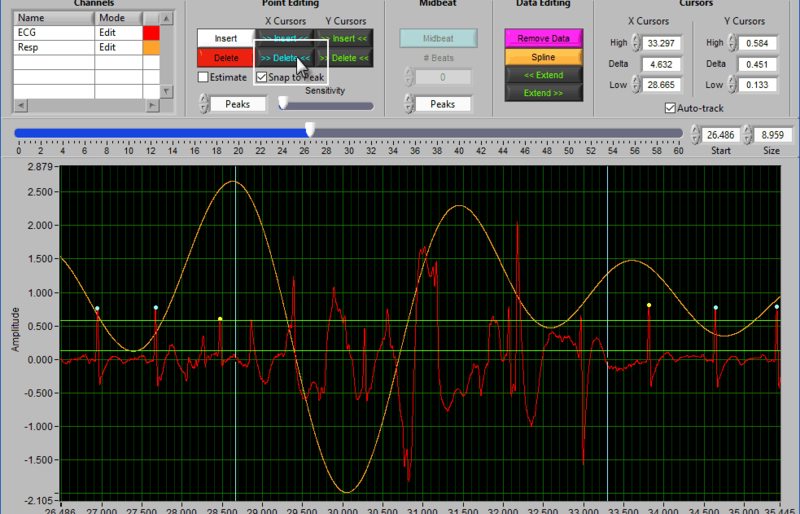 The Y cursors should now be positioned so that all erroneously marked R peaks fall between them. 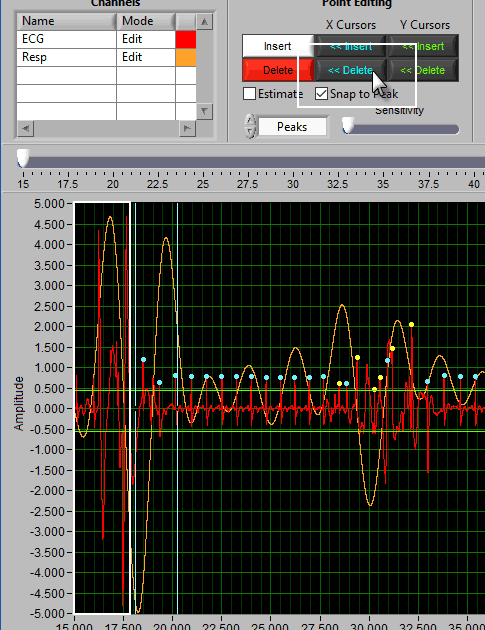 Be careful not to set your high Y cursor too high, or you will accidentally delete good R peaks too. Once the cursors have been positioned, press the Delete All Pts Between Y Cursors button to remove them all. 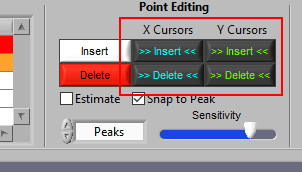 There are two types of cursors in the signal editor – blue vertical “X Cursors” which allow selection of a time range in which to delete points, and green horizontal “Y Cursors” used to select an amplitude range. There are 4 different ways to use these cursors, which can be toggled by different combinations of Ctrl and Shift hotkeys. By default, they will operate on the signal between the cursors, as indicated by the >> << symbols. 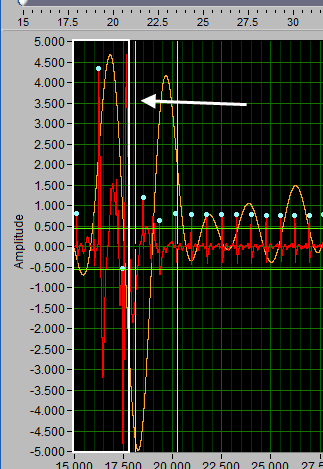 Due to the need for a 30-second contiguous R peak series when calculating RSA, points will need to be identified or estimated when making the above edit when using the HRV application. There may also be situations when the ECG morphology is such that components other than the R peak are being misidentified as the R peak. In this situation, use the Y cursors to delete all points in an amplitude range. 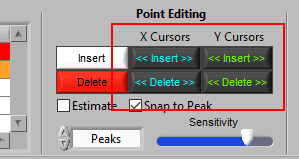 Simply drag the cursors to include the erroneous peaks, but exclude the proper ones, and press the >>Delete<< button.